Waiting in line for movie tickets is still the worst part of going to the movies (unless you are going to see The Bounty Hunter). With so many mobile phone movie apps, it’s easy to find what’s playing at nearby theaters and even purchase tickets right from your mobile phone, but then you still have to get a paper ticket from the dispenser or the ticket agent. But your ticket could easily be delivered to your mobile phone via a 2D barcode. 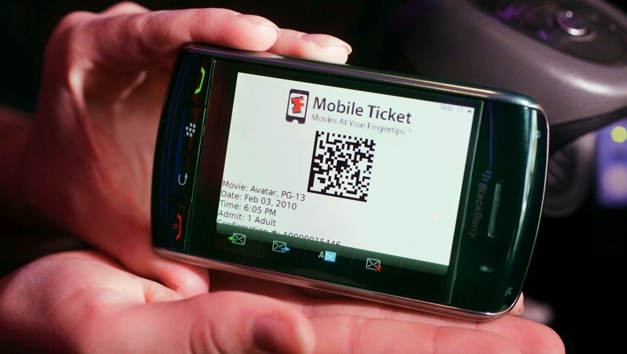 Today, Fandango is launching a mobile ticket program in eight cities which lets moviegoers finally go paperless. Your ticket is delivered to your mobile phone via an SMS or MMS message linked to a 2D barcode, which the ticket-takers can scan. Movie theaters need to equip their attendees with special scanners, which is why it is only available in a few markets. (MovieTickets.com is testing a similar program).